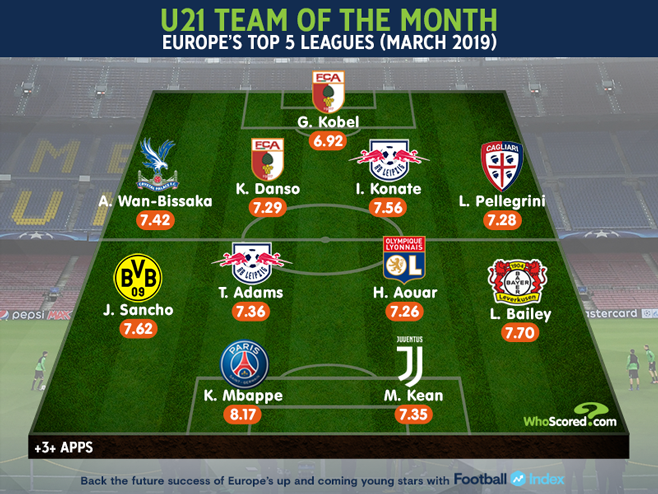 Here we reveal the best WhoScored rated XI for players aged 21 and under in Europe’s top five leagues last month. Augsburg goalkeeper Gregor Kobel kept one clean sheet in four appearances in March and was the WhoScored Man of the Match in a shock 2-1 win over league leaders Borussia Dortmund. Kobel made more saves than any other goalkeeper aged 21 and under in Europe’s top five leagues last month (14) and also ranked top for crosses successfully claimed (4). Cagliari eased their relegation woes in March after a run of three wins in four matches and Luca Pellegrini was a standout performer for the Serie A outfit in that time. Pellegrini registered an assist, his first of the season, in a 3-0 win away to Chievo to close out the month. The Roma loanee also completed 14 tackles and interceptions combined in three appearances. RB Leipzig did not concede a goal in four league matches in March and Ibrahima Konate played a key role in that. Konate finished last month as the highest WhoScored rated centre-back in Europe’s top five leagues of players aged 21 and under. The Frenchman won possession in the defensive third more times than any other youngster (18), while ranking second for both clearances (26) and aerials won (22). Augsburg centre-back Kevin Danso partners Ibrahima Konate at the heart of the back four after an impressive run of form in March. Danso registered his first goal involvement of the season in a 3-1 win over Hannover and was the WhoScored Man of the Match. Danso ranked one place behind Konate for clearances (20) and aerials won (18) in Europe’s top five leagues of players aged 21 and under, while only one player won more interceptions than the 20-year-old. The bubble is yet to burst for Crystal Palace starlet Aaron Wan-Bissaka, more than 12 months on from his Premier League debut. Wan-Bissaka, who is being heavily linked with high profile moves at the end of the season, helped Palace to two wins from three league matches in March. Wan-Bissaka completed 16 tackles and interceptions combined and 14 clearances in those games. Not only that, but no player even managed to dribble past the 21-year-old. Leon Bailey has endured a fairly underwhelming season but the 21-year-old did find some form for Bayer Leverkusen last month. Bailey scored twice in four league appearances in March, while only Jadon Sancho completed as many dribbles in Europe’s top five leagues of players aged 21 and under (both 15). Bailey failed to register an assist in March but did create 10 goalscoring chances that his teammates failed to convert. Ibrahima Konate was not the only youngster that caught the eye for RB Leipzig last month, with Tyler Adams also impressing. The 20-year-old has made a seamless transition into life in Germany since joining Leipzig in January and already looks astute business. Only one player aged 21 and under in Europe’s top five leagues attempted more passes than Adams last month (267), while the USA international ranked top for possession won in the middle third (20). Houssem Aouar ended a 10-game goalless run in March to net in a 3-2 victory over Montpellier. In three league appearances last month, the Lyon starlet’s WhoScored rating did not dip below 7.00 once and gradually improved with each performance before peaking at 7.71 in their final game of the month against Rennes. The 20-year-old completed nine tackles over matches against Rennes, Montpellier and Strasbourg, completed six dribbles and registered five key passes. Jadon Sancho’s startling form is showing no signs of relenting after another eye-catching month in March. The Borussia Dortmund whizz is now being linked with a £100m move to Manchester United and it’s no surprise Ole Gunnar Solskjaer’s side are keen on the 19-year-old. Sancho provided more assists than any other player aged 21 and under in Europe’s top five leagues last month (three), while ranking joint-top for dribbles completed (15). Kylian Mbappe has scored in his last seven league matches, with four of those games falling in the month of March. The Paris Saint-Germain star has led the line in the absence of Neymar and Edinson Cavani with aplomb and scored at least two more goals than any other player aged 21 and under in Europe’s top five leagues last month (5). More than 21% of Mbappe’s touches of the ball in the league last month were in the opposition penalty box, managing the most of any player aged 21 and under in the continent’s biggest leagues (38). Instead of celebrating Moise Kean’s performances on the pitch, we are instead forced to focus on the unacceptable racist abuse he suffered against Genoa earlier this week. Kean has been a breath of fresh air in an underperforming Juventus side since the end of last month, scoring three goals in three league appearances in March. In fact, only Mbappe scored more times of players aged 21 and under in Europe’s top five leagues last month. 3. Kalidou Koulibaly: Is he the centre-back Manchester United need? 4. How did Norwich City become so dominant in the Championship?